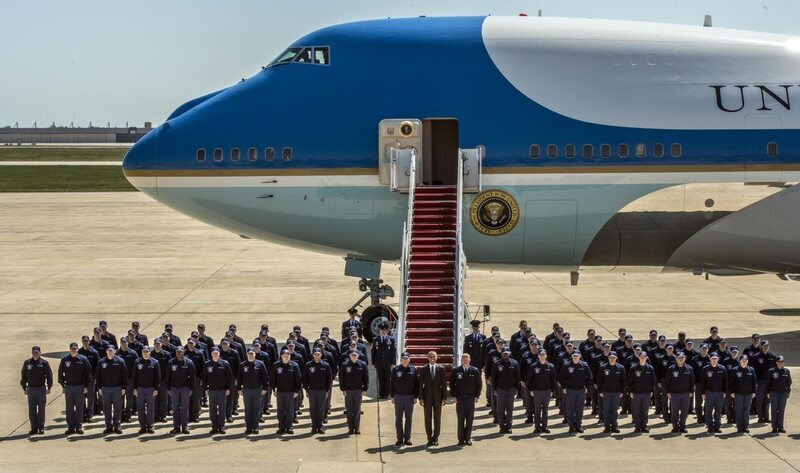 WASHINGTON — The U.S. Air Force on Tuesday awarded Boeing a contract worth just less than $600 million to begin the preliminary design of the next Air Force One planes. As the Republican presidential candidate, President Donald Trump critiqued the cost of the program, bringing much public attention to one of the Air Force’s smaller procurement efforts. But while the service has stated that it was able to get a good deal on the two Boeing 747-8s that will become the next Air Force Ones, it reiterated that cost-saving work will continue during the preliminary design phase. Due to the attention from Trump, the Air Force and White House worked together to re-evaluate the Air Force requirements with an eye on shearing off expensive and non-vital capabilities. The service has disclosed some changes to the overall design, such as nixing a requirement for aerial refueling. However, for the most part, it has kept mum about how requirements have changed and how much money has been saved on the program. The White House and U.S. Air Force are finalizing the requirements for the Presidential Aircraft Recapitalization program. As part of the preliminary design phase, Boeing will design modifications to a baseline commercial Boeing 747, including the integration of military-specific communication systems, electrical power upgrades, medical facilities, self-defense systems, an executive interior complete with medical facilities and “autonomous ground operations capabilities,” according to the Air Force news release. The September award was one of two major contract modifications expected to be allocated before the end of fiscal 2017. In August, the Air Force awarded Boeing a contract for two 747-8 airliners, making the unorthodox decision to buy two previously built planes sitting on Boeing’s production line at a discounted rate. The service did not disclose the value of the deal because it could lower the company’s asking price in future commercial deals. “We got a good price,” Air Force Secretary Heather Wilson told Defense News during an Aug. 29 interview. The U.S. Air Force has awarded Boeing a contract for two 747s that will be converted into presidential airlifters. The next big upcoming milestone is the contract for engineering and manufacturing development, where Boeing will continue to refine its design, modify and test the two new Air Force One aircraft, and then deliver them. Boeing is expected to start aircraft modifications in 2019, and the new Air Force One planes could begin replacing the aging VC-25A models as early as 2024.